If you know me, then you know how much I love NFL draft season. Nothing gets me more excited than watching my beloved Detroit Lions waste away a top 10 pick for some useless hack of a talent, but that is besides the point (they are picking 5th this year). More than anything, from a football standpoint, it is the signal of a new year and a new beginning: a new beginning for teams who are looking to avenge their previous failures, for players who have had a tough season, or a city who is looking for a reason to cheer! The storylines are endless and the drama is even better. But what if the idea of a "draft" applied to more than your major sports (football, hockey, basketball, baseball, soccer, etc.)? What if it applied to those college students who weren't just looking to make the leap to professional sports? What if it applied to the rest of the working world? Like other major sports, the NFL rewards the teams who struggled the season before with the top pick in the next year's draft. In an effort to level the playing field, those teams are granted the opportunity to scout, communicate with and choose the best talent available from the collegiate ranks. It is never an exact science, but for the most part, teams at the bottom of the league and top of the draft tend to find the best talent. Of course, there are always going to be late round sleepers (i.e. Tom Brady, Terrell Davis, Zach Thomas) or undrafted gems (i.e. Kurt Warner, Wes Welker, Arian Foster), but your future starters/contributors are heavily weighted towards the beginning of the draft. 1. As I alluded to early on in this blogpost, those top teams or organizations are scouting the best talent out there. Therefore, you need to gain some visibility so that others can find you. This means being active at conferences in your industry, finding opportunities to volunteer, developing a social media presence (Twitter, LinkedIn, Blogging, etc.) and actively networking with the established professionals in your field. 2. What skills do the top graduates in your field possess? Since you are going to be measured against the top talent in your draft pool, you better have an idea of what they can offer and figure it out before it is too late. Is your skill-set comparable? If not, where can you gain skills and experience that will add to your overall brand as a professional? 3. 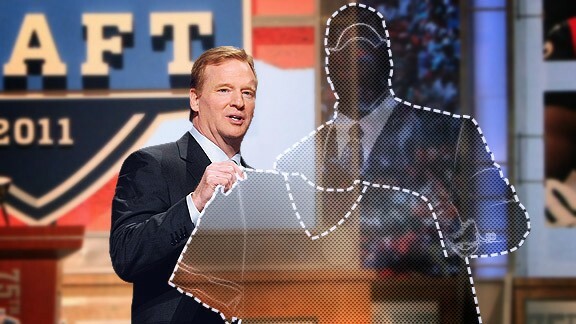 The idea of "best fit" will always be important for an organization, just as it is for NFL teams who are looking for a player to fit their scheme. For example, if there is a team in the top half of the draft who needs a defensive end, there might be three quality players available at that position when it comes their turn to pick. Who they decide to draft may not be the best "talent" available; it may be the player who has the intangibles that they are looking for (i.e. leadership, work ethic, locality, etc.). Therefore, know the intangibles that these organizations/companies may be looking for, including willingness to relocate, variability in pay, and advanced levels of knowledge in certain areas. So... are you a 1st round talent? Or a late-round sleeper? Ultimately, it's up to you, your education, and how proactive you have become in the development of a personal brand.